WebKit (well, one twisted soul, I think) has started a meme collection. It’s true that Mozilla has a quotes database, which sometimes we are even gracious enough to share with them [more here]). 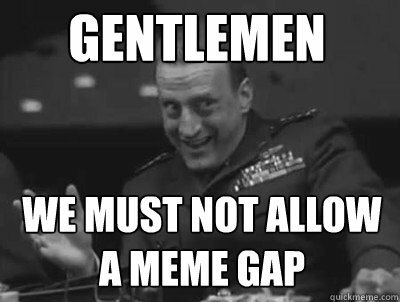 But we have no meme collection. Buck Turgidson does not approve. Mozilla Internetizens, fix this. Pronto. UPDATE: jdm follows through with Mozilla Memes. Next step: ADDRESS THE GAP. UPDATE 2: The gauntlet has been thrown down.